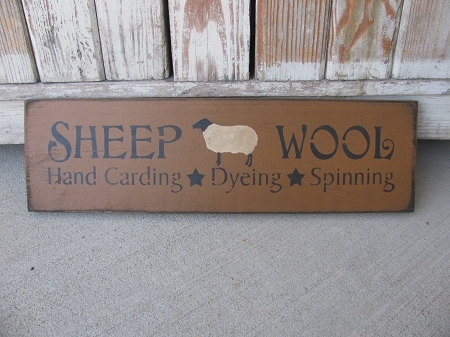 Primitive Sheep Wool Hand Carding Dyeing Spinning Hand Stenciled Wooden Sign. I love to decorate with sheep in my primitive home decor. This sign says it all. I've hand painted/stenciled this sign shown with an english mustard background and black lettering. Other options are available. I made the sheep true to color. Size is 19"x5 1/2". Solid 1" thick Pine board. Hanging options are available. Hand made by Heidi.